Close to My Heart helps YOU unlock your creative potential. For more than 25 years, Close to My Heart has been a pioneer and leader in the papercrafting and scrapbooking industry. Their product line includes rubber stamps, embellishment and accessories for crafts as well as tools and more. With a goal to help everyone from the total crafter to a novice create wonderful projects and preserve memories, a Close to My Heart Consultant like Roberta Stafford is ready to help you. I received a great collection of products from Close to My Hearts partnership with Provocrafts brand Cricut products to share with you for the 2014 Holiday Gift Guide here on Party Plan Divas.com. I will admit, I’m not the worlds best crafter in that I sometimes find it hard to be creative or be inspired on my own. This is also in part due to my busy schedule and most of the free time I have between training Divas worldwide to better their businesses and my other work, I’m trying to spend quality time with my loved ones. Any tool that can help me both preserve my memories with my friends and family better than a drab old photo album and help me save time while doing so is a tool I definitely want to try! The Close to My Heart Cricut Artbooking Collection gives you the opportunity to bring your scrapbooking and papercrafting to a whole new level to wow your friends and family. With 15 different layout themes, the Artbooking Collection allows you to mix and match accents, borders, overlays, and more to create beautiful and one of a kind works of heart. 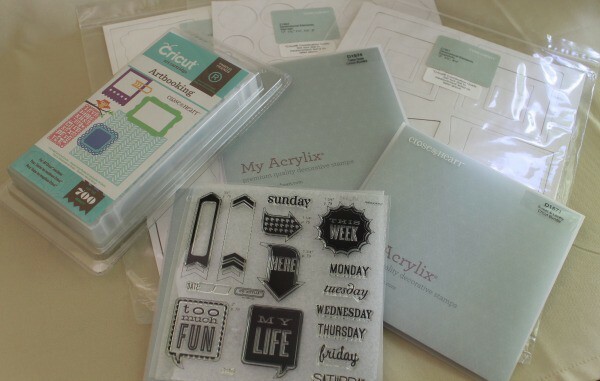 Using the Provo Craft Cricut Artbooking Cartridge with your Cricut machine you can quickly and easily cut out embellishments, titles, shapes and more and coordinate these cut pieces with the Dimensional Elements with coordinating shapes. Kick your layouts up even more by adding stamped images using the My Acrylix coordinating stamp sets. With themes for Birthdays, babies, friends, holidays and more, the Cricut Artbooking collection has you covered for any occasion to create beautiful handmade gifts, decor and more as well as preserving the memories of these occasions. The Dimensional Elements easily pop out and with a few buttons pushed your Cricut has cut the proper matching shape to your element to which you mount your decorative paper and that easily you have custom embellishments for all your crafting needs. Close to My Heart consultants offer home parties and classes across the US as well as in Australia and New Zealand and has an amazing hostess rewards program that gives hosts the opportunity to choose their favorite products at discounted prices and FREE! When you are a Close to My Heart consultant, not only are you able to have an income stream but you are also out inspiring others with creativity and helping them find their potential using the wonderful tools, products and tips to create unique and memorable projects.